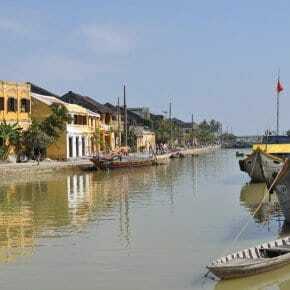 We’d done the local sightseeing in Mui Ne; the Fairy Stream, the dunes and the fishing village. We’d spent hours mesmerised by the kite-surfers and we’d kicked-back and chilled on the long sandy beach. So what to do next? 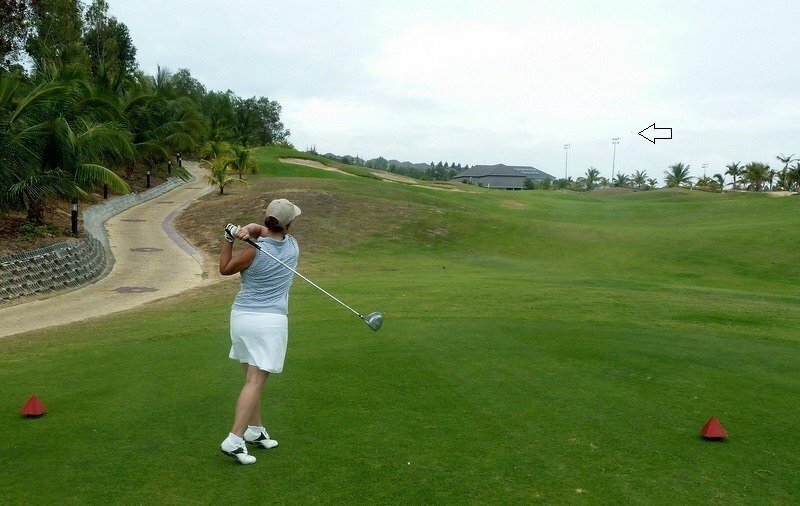 Now this may surprise you but on our third day in Mui Ne we took up our clubs and played a round of golf at Sea Links Golf and Country Club in Ham Tien. 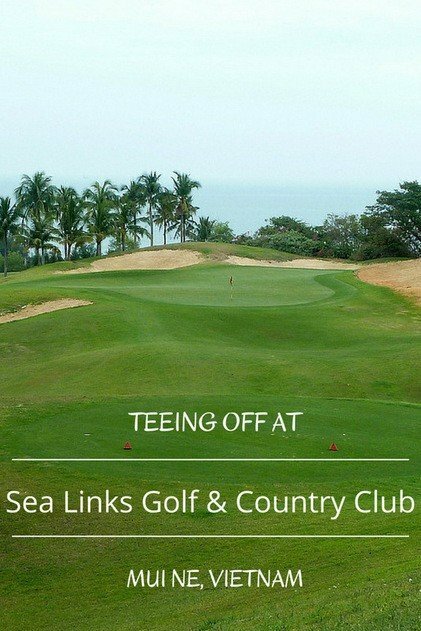 Just five minutes in a taxi from Mui Ne, Sea Links is the first links golf course in Vietnam, a world-class course offering international tournaments. 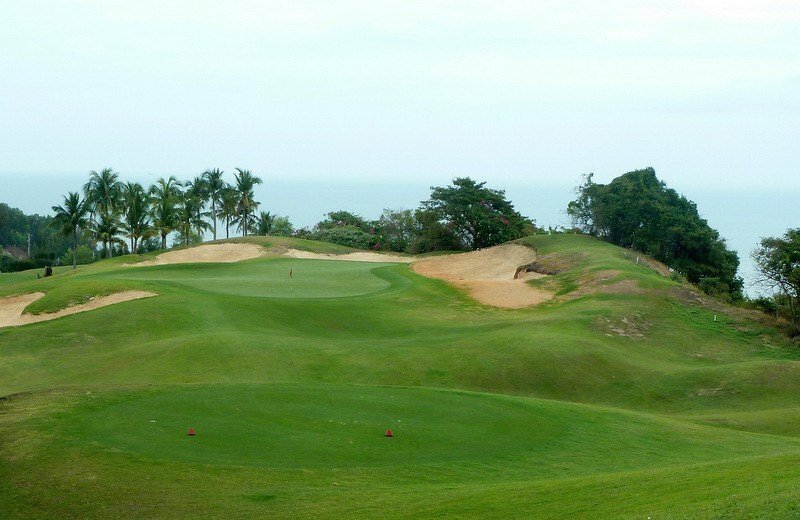 It’s one of the most challenging links courses in Asia and combines wonderful ocean views for players to enjoy whilst negotiating the rolling fairways and demon bunkers. It was designed by Ronald Fream and Golfplan Design Company from the US and we were heading there to play 18 holes. I was nervous. There are certain rules when playing and it’s compulsory at Sea Links to each have a caddy. So after changing into our golf gear we met up with our course companions. Mr Jones’ caddy was a young lady called Phuong and the guy helping me out was named Công; both very friendly and a lot of fun. 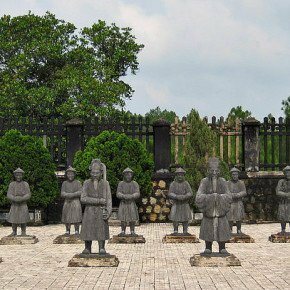 They almost looked like bee-keepers dressed in wide-brimmed hats with fabric covering the neck and the masks that you see many Vietnamese people wearing, gloves and high-necked sweaters. They must have been sweltering. We asked the reason for the masks and it’s all down to sun protection – Phuong said she can’t afford to buy sun-cream so she covers up her face with two masks. 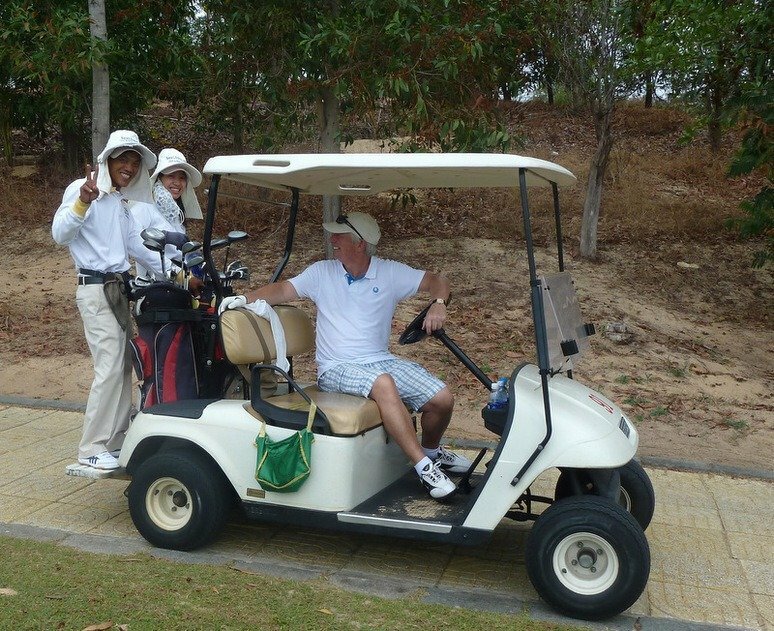 We hopped into our buggy with Công and Phuong riding pillion and Mr Jones at the wheel and sped off to the first hole to tee-off. 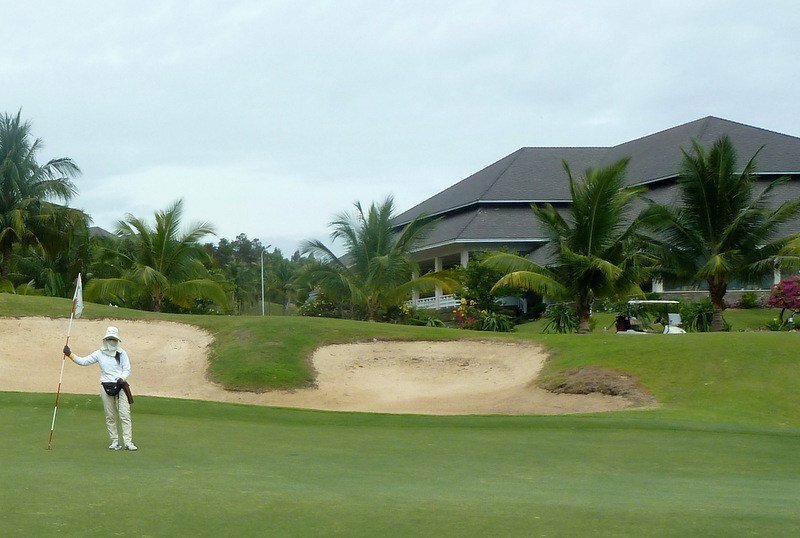 Công was so helpful, a much better golfer than I am, and chose the perfect clubs and gave some really good advice at each hole which helped a lot – and he didn’t laugh when I took an air-shot! He’s a player himself and plays the course weekly so he was able to give me some tuition as we went round. To Mr Jones’ dismay I won the first three holes! Công and Phuong were quick with the banter so we had lots of laughs. 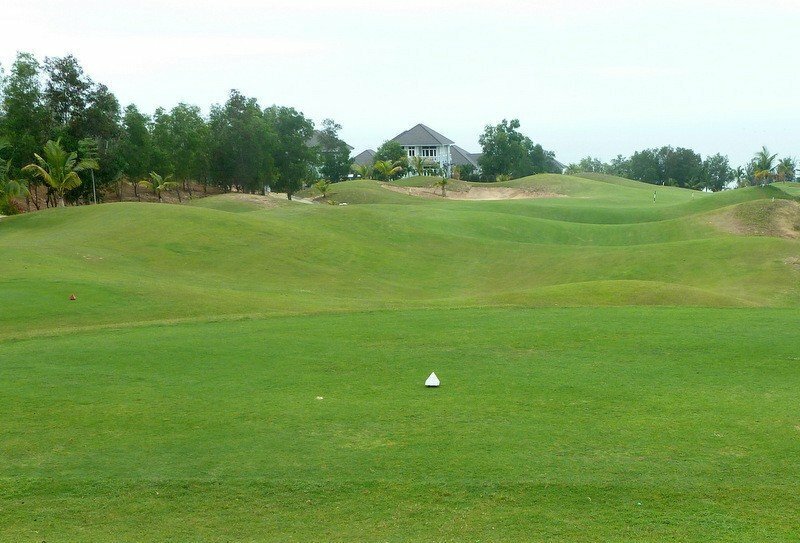 The course is beautifully lush with billowing fairways rippling towards the pristine greens. 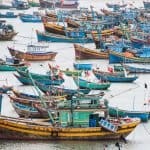 Set high on a cliff, 60 metres above sea-level, the views across The South China Seas and panorama of Mui Ne Bay are stunning and there’s a refreshing sea breeze. The course retains many of the sand dunes that it’s built on so there are no shortage of bunkers and there are water hazards to play with your mind. 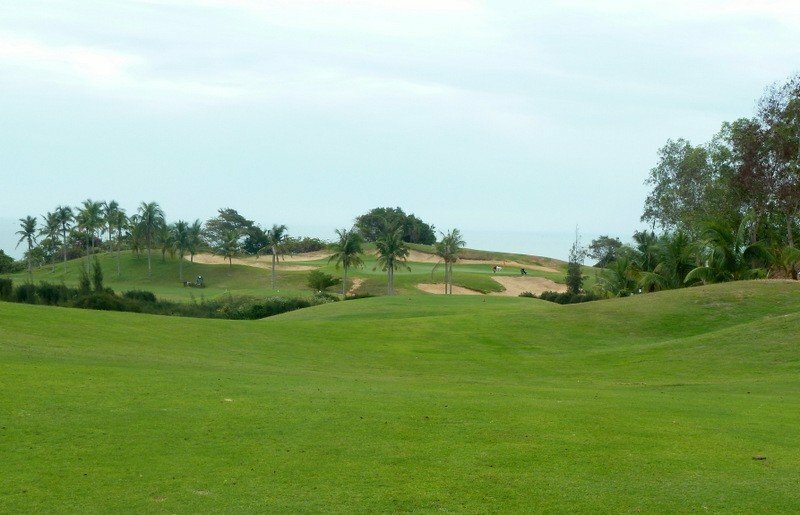 The course is 18 holes par 72 (7623 yards). It’s been described as ‘challenging but fair’. I’ll go with the challenging! There’s also a driving range up by the club house. Half way round we stopped off at the clubhouse for a bite to eat and a really cold Tiger beer before setting back out into the heat. Công and Phuong giggled their way around the course with us and we had a really enjoyable day with a bit of healthy competition, chatting with the caddies and taking in the views. It took around 5 hours including the break for a snack and I was really tired by the time we finished but happy that I’d only lost two balls. I didn’t search too hard for them in the rough as I wasn’t sure what creatures were lurking. 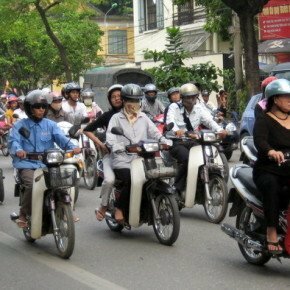 The cost of the round including buggy and club hire was around 2425 VND per person which is expensive. The leading five-star golf resort has 315 villas and a 188 room hotel with swimming pools spa and tennis courts and is just over the road from a wide sandy beach. Are you a golfer? What’s your favourite course? Thanks so much for sharing! I would have never thought of Vietnam as a consideration for playing golf. This is something that every visitor should consider. It seems like a once in a lifetime experience. Thanks for sharing your experience. That looks like a really fun golf course! One of my favorite things to do on vacation is play golf. 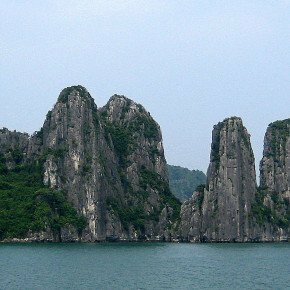 If I ever get to go to Vietnam, I’m going to look up this course. 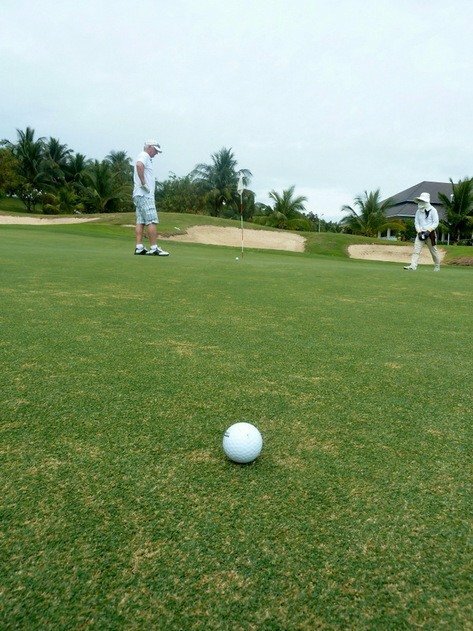 I had no idea you could find such great golf courses in Vietnam! Sounds like quite a nice break from all the cultural activities. I’ve never really played golf – not unless you count crazy golf and I wouldn’t say I’m particularly good at that either!! I am laughing over here loving the caddies get up! Reminds me of my stay in Hoi An, seeing how the women covered up everything to protect themselves from the sun. Of course, heat indexes were reaching freaking 125 F during these times! Mind boggling how these folks would work all day on the beach with much of their body covered, with heavy clothing too. Fun recount and no, not golfing much these days although this Sea Links club looks like a place to visit. No wonder it was hot, it was on February and summer season there in asia will start around the end of the month or so. Also, you have great posture!